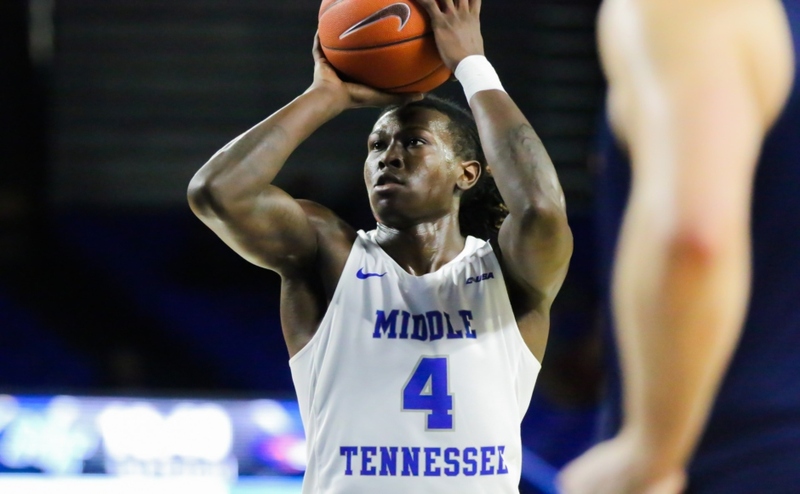 The Middle Tennessee Blue Raider men’s basketball team team took the court for the first time of the 2016 season on Thursday. They faced the North Alabama Lions at Murphy Center for an exhibition showdown. 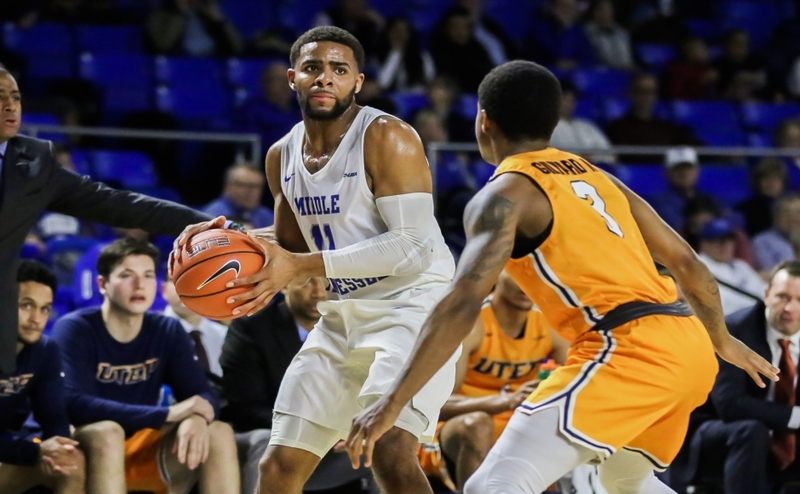 The Blue Raiders shined in convincing fashion and found success from behind the three-point line to defeat the Lions 96-63. The Blue Raider offense showed their explosiveness right out of the gates. Freshman Tyrik Dixon hit two consecutive three-pointers to put the Blue Raiders up by 10 points in the first half. His second three came off solid ball movement around the court to the corner where he drilled his shot from behind the arc. Within the first five minutes, it was a three-point showcase for the Blue Raiders. Giddy Potts and Dixon combined for five three-point attempts and connected with all five. Forward Brandon Walters anchored the defense with his height advantage standing at 6 feet 10 inches tall. Walters made his presence felt in the paint and caused havoc for the Lions. The Blue Raiders disrupted the lanes which caused UNA to struggle in close at the rim. The Blue Raiders got into the bonus with 8:47 remaining in the first half and capitalized on the opportunity. MT shot 13-18 from the line throughout the first half. Reggie Upshaw hit a contested fade away in the paint and followed it up with a bomb from behind the arc to extend the Blue Raider lead 43-17. 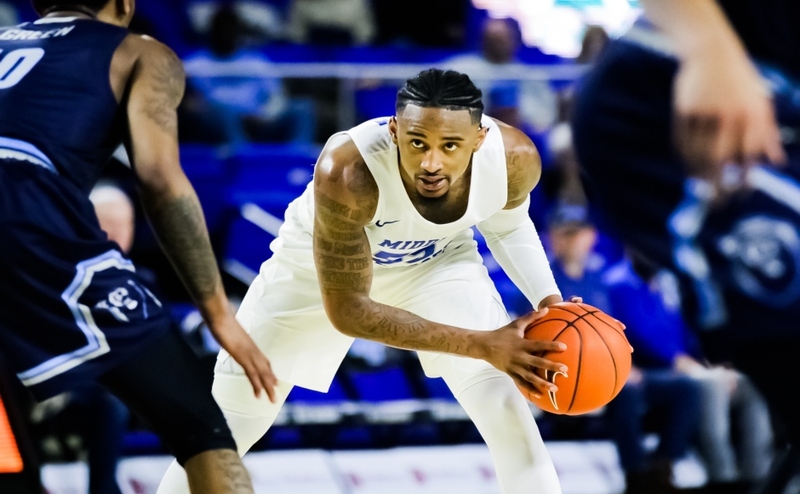 The Blue Raiders kept their foot on the pedal and continued to dominate in all phases, but the Lions cut the MT’s lead from 30 points to 22 just before the end of the half. Continuing to fire from deep and let it rain all night long, they maintained their identity from last season and persisted as a three-point shooting team. “I thought we shot half of our shots from three, and I think we are a really good three-point shooting team,” Coach Davis said. Coach Davis dispersed the minutes well between starters and using the depth of his bench. The Blue Raiders played outstanding defense as well. They suffocated the Lions all game and held them to just 35.1 percent from the field and 30.8 percent from three-point range. Just under 13 minutes to play, Potts threw a beautiful alley-oop to Upshaw for the slam. The Blue Raiders played as a cohesive unit and shared the balled effectively. The passing by MT was crisp and on-point the entire game. They tallied a total of 18 assists with JaCorey Williams leading the team with five. Ultimately, the Lions comeback attempt was too steep to overcome. 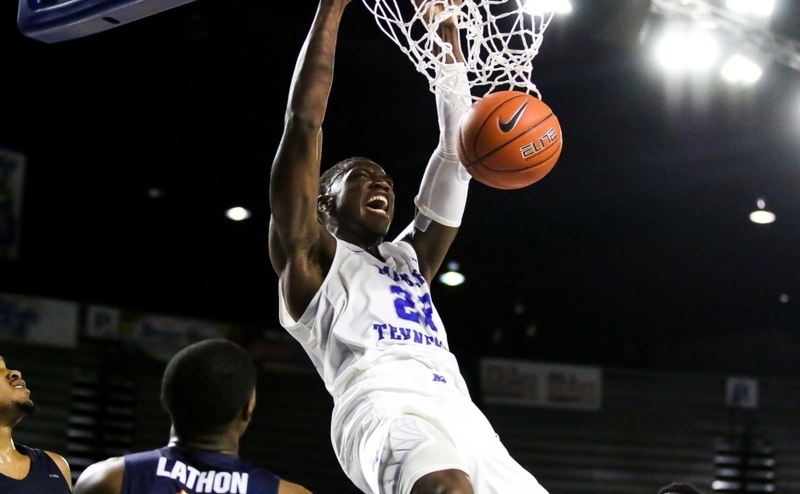 The Blue Raiders cruised to victory in their first matchup winning by 32 points. The Blue Raiders controlled the game from start to finish, out-hustling the Lions in rebounds (56), points off turnovers (18) and second chance points (21). Potts scored a team-high 19 points while Williams added 14 and Upshaw chipped in 13. Potts also led the team in three pointers made with five. As a whole, the Blue Raiders shot 49.2% from the floor and 41.9% from long distance. The Blue Raiders will welcome the Milligan Buffalos to Murphy Center in their next matchup on Nov. 11 at 11 a.m.